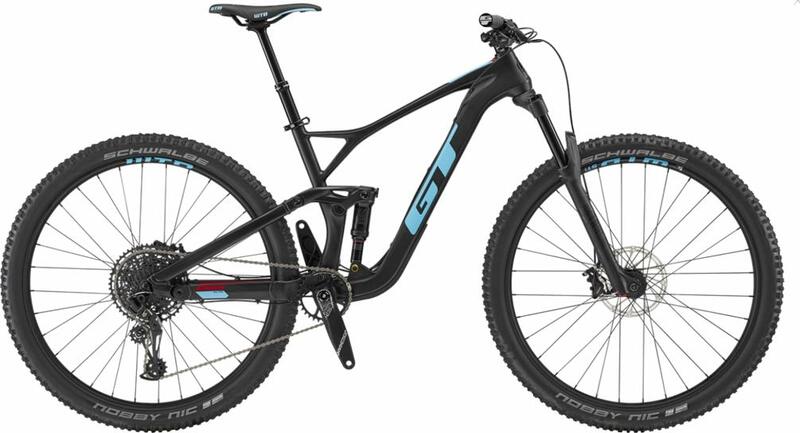 The GT Sensor Carbon Elite 29er is designed for the aggressive trail rider, and built around a new take on GTs iconic LTS design. The Sensor is a 130mm, 29er trail bike for the rider that wants to ride fast and concentrate on the joys of it. The frame includes a carbon front triangle with alloy rear triangle and is engineered around a metric trunnion mount shock design, which permits for a longer-stroke shock, making improvements to adjustability and performance of the frames suspension, which you’ll manipulate on your liking with GTs inclusion of a flip chip. The Carbon Elite controls this suspension with a RockShox Deluxe R shock, which mates seamlessly with a 130mm RockShox Sektor fork to deliver tremendous capability in a built-for-speed 29er platform. Youll apply that speed liberally by the use of SRAMs wide-range NX Eagle 12-speed drivetrain, harnessed by a pair of grippy Schwalbe Nobby Nic tires on burly WTB rims. SRAM Level TL hydraulic disc brakes have great power and tight modulation to keep it at the fun side of fast, and a dropper post ensures youre wringing each last drop out of the Sensor, both at the way up AND down. Amazon.com Price: $339.99 $199.00 (as of 22/04/2019 22:15 PST- Details) & FREE Shipping.